I spent the weekend at Trish Downing’s first Camp Discovery. 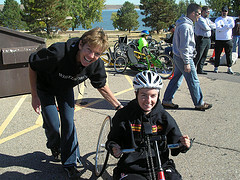 Trish is a wheelchair athlete who has been competing in triathlon for nine years. She put together Camp Discovery for women in wheelchairs, to expose them to the variety of sports that are out there, to provide them with role models, and to help them make the transition from able bodied person to adaptive athlete. There were fifteen campers (it seems strange at the age of 49 to refer to myself as a “camper”, but I’ll try). 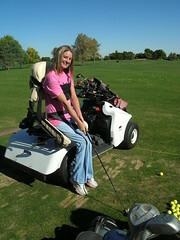 Most had spinal cord injuries or spina bifida. As far as I know, I was the only participant with MS. Campers’ ages ranged from twenties to sixties. Trish and her committee (which included handcyclists Kim Prussia and Sherry Schulz (Sadler’s Alaska Challenge, Ride the Rockies)) did an amazing job pulling together the grants, volunteers and resources necessary to make the weekend fun, comfortable, and educational. Trish recounted her own early years in wheelchair sports, and the fact that there were so few female athletes to learn from. She hopes that the shared information and contacts provided by Camp Discovery will help budding female competitors figure things out quickly. 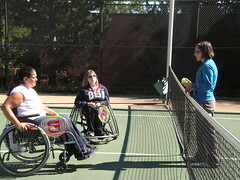 The weekend included both introductions to a variety of sports activities (golf, tennis, handcycling, SCUBA, weights, Pilates) and a taste of life coaching and meditation techniques. Trish also threw in some fun, pampering activities, rounding up a bunch of friends to provide massages, facials, and spa treatments to campers. Since I’m training for my first triathlon, I was excited to have the opportunity to ask Trish about the logistics of doing triathlon, and it was fun to hear her mention that in her opening remarks: “Maybe all you want to know is how to pee during a long event–in that case, I’m happy to tell you about it.” So let’s get the peeing over with right away. The choices basically boil down to 1) indwelling catheter and leg bag; 2) intermittent catheterization; 3) somebody having your chair or crutches or whatever mobility aid you need available when you need to make a stop, and 4) peeing on yourself (“that’s what the men do”). Which one you pick depends on your disability (is this really the time to learn how to do intermittent catheterization?) and what kind of activity it is (is this a competitive event in which you cannot afford the 15-20 minutes to get to a restroom and back on the bike?). Luckily, the triathlon I’m planning is a sprint distance event, so the peeing question shouldn’t arise. My swim coach has been telling me that I’m going to wear a wetsuit in the swim leg, and I’ve been resisting that advice (“wetsuit? in an indoor pool? for a 525 yard swim?”). But I talked to several wheelchair using swimmers at the camp, and you know what? They use wetsuits, or at least wetsuit bottoms, to keep their legs from dragging. This improves their swim times and saves energy. They talked me into it. One of the things I came away from was that you’re not necessarily going to be able to do your sport exactly the way you think you “should”; instead, you’re going to do what you’ve got to do. And if that means peeing into a bottle, learning to cath, or wearing a wetsuit even if nobody else is, that’s how it is. I also learned (or am trying to learn) to accept more help. A camp volunteer, who doesn’t live far from me, offered to be my triathlon support person, to help me get in and out of my wetsuit, fetch my chair, help with transfers, and so on. What a great offer! The staff to student ratio for the SCUBA lessons was approximately 4 to 1, and it was hard for me to accept that it took that many people to get me underwater blowing pretty bubbles and playing with toys. But it was great fun, and I’m grateful to all those people for being willing to do it (and doing it so well). Craig Hospital – Craig provided the super wheelchair bus (at one point I counted 8 riders in wheelchairs), and the lift always worked. Craig therapists and nurses helped out at the handcycling session, and gave a talk on wellness and our senses. Denver Parks and Rec – Denver Parks and Rec provided the bus on which the lift didn’t work, but that showed me how a group of determined people can work around obstacles. Campers got themselves into a variety of private cars, and all the wheelchairs and some handcycles were loaded onto the bus. Kelly and Jim also helped out handcyclists. Adaptive Adventures – I’ve seen Mau and Mark from Adaptive Adventures roll up at a number of events and just start unloading handcycles, fitting handcycles, fixing handcycles, teaching shifting and steering. They’re always friendly, supportive and incredibly helpful. National Sports Center for the Disabled – Also brought a truck load of handcycles and got campers fitted up and out on the road. A-1 Scuba – The instructors and volunteers here were professional, kind and patient. They clearly love what they do, and have lots of experience assisting disabled divers. A lot of these organizations focus primarily on the person with spinal cord injury, and if you’ve done rehab at Craig Hospital, you’ve been exposed to an incredible number of opportunities and resources for fitness and wellness. If you haven’t had a traumatic injury, and your disability has come on slowly and sneakily, you may need to be more proactive in searching out those opportunities. Don’t be put off thinking that a particular program is just for SCI, or just for vets, or just for senior citizens. Pick up the phone, or send and email, and talk to the organizer about whether it would work for you as well. Trish hopes to make Camp Discovery an annual event. Keep an eye out for the next camp, because it’s a great opportunity to try out sports you may have been missing, learn about what’s out there, and meet other women who are trying to get and stay fit and active. Sounds like a blast. I can’t imagine how difficult it may be to don a wet suit. Able bodied people make it look like a form of torture. Bravo to Trish for putting on such a great event. Congratulations to you Katja for stepping out of your comfort zone and experimenting with new experiences. It was a pleasure getting to know you. Good luck with your triathlon endeavors. You’ll do great! Linda was there all weekend as well – she is a life coach. Check out her website at http://www.hccoach.com/. Thank you for this report of this camp, hopefully if they do it more than once a year I could attend the next one. The info on wearing a wetsuit for swimming is important as is the cath reality. I happen to be on the Big Island Hawaii as part of a “I’m not Dead Yet” vacation to see the lava and mountain. It happens the Ironman Triathalon is occuring this weekend. I did wonder if they have a wheelchair division. For triathalons, do you do a wheelchair bike then transfer to a racing chair for the 10K? If so, I have to get to the pool, as I have done the 10K, and the wheelchair cycle I can rent for $5 locally, and have done that. I just have to look around for a triathalon (and do the swimming training). Thanks for the idea and the realistic information to plan to attempt something like this. I hope your plans and your future triathalon will be a success. Hey, Elizabeth – I’ve been following your Hawaii adventures, and hope you and Linda and Cheryl are really enjoying yourselves. Yes, you swim pretty much like a regular person, except that you can wear a wetsuit at any temperature, and you can have help getting in and out of the pool. 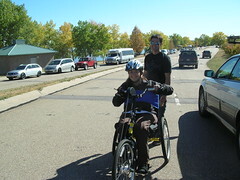 Then you handcycle for the bike leg, and use a pushrim racing chair for the run leg. Here’s a link to USAT’s rules: Competitive Rules. Look for the section titled “USA Triathlon Rule Modifications for Physically Challenged Athletes”. So lovely to hear of all your updates. Umm Wow. And yes. Well, reality is rather interesting right? Good luck and keep us informed? My goodness, I have read the rules and they are close to the most discriminatory anti-disability participation rules I have ever read. So, if I understand correctly, a competitor with MS 4, with spinal lesions MUST run for 10K? As must someone who with Muscular Dystrophy who is using a portable ventilator to breathe. They are least are not required to have a ‘handler’ like the sight impaired do. (“all sight impaired are required to have a handler”). Ahh, who put this wording together and what happens when someone with a hip and arm ampution shows up? Les Authes which means, “The Others” – one of the more offensive terms left over from the ‘spastic games’ (now known as the paralympics) has various classifications for ways to participate for the various diseases/impairments while this states that unless a hand is on the brakes, or unless the ‘handler’ is less than 18 inches away the entire time the sight impaired person is disqualified. But that the ‘handler’ must not assist in ‘pacing’ even though the sight impaired person can use the ‘holding elbow’ as a form of guidance and must supplier their own ‘handler’. So the person must, for an entire swim, cycle, run, be less than 18 inches away, but not in any way ‘pace’ the person who they have been training with presumably? Sorry, I just get a bit wound up when I start reading about organizations trying to put everything into simple and absolute catagories when oddly, impairments, and illness’ aren’t. But thank you for the rules, I will still work to compete and then write to them to see if a bash of reality might help them give some flex to those rules (a thamedalite (sic) competitor with no legs or arms MUST use a regular cycle and run the 10K as thier impairment is not a result of an amputation).